"What's love got to do with it?" may be associated with the biographical Hollywood film based on the life of rock star Tina Turner. However, Rev. Olav Fyske Tveit the head of the World Council of used the title the Inaugural Michael Huffington Lecture at Los Angeles' Loyola Marymount University. Tveit visiting Los Angeles this week from March 30 to April 4, preaching at the Hollywood United Methodist Church, before delivering the Loyola Marymount University lecture, and meeting with ecumenical organizations and groups. 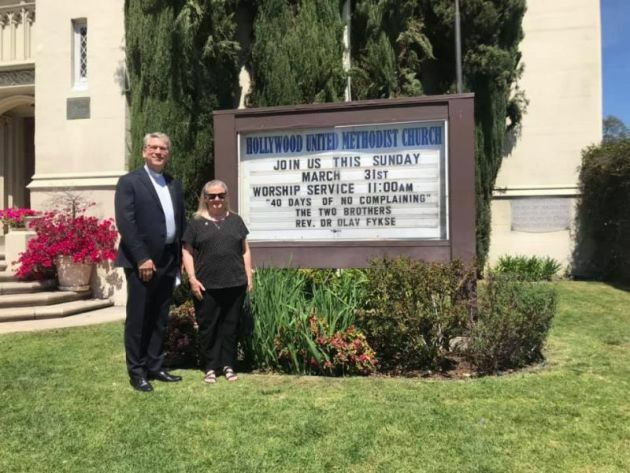 In Los Angeles on April 1, the WCC's general secretaryTveit spoke on "Christ's love moves the world to reconciliation and unity." That is to be theme of the WCC 11th Assembly in 2021 in Karlsruhe, Germany. The world needs love, the kind of lifesaving love that is a profound source of unity, Tveit said. "We are neither called to promote, nor to be a source of conflict and polarization," he said. "That means that we cannot ignore tribalism, racism, nationalism, or any other form of exclusivism – if we are to be the followers of Christ in this world." Reconciliation and unity occur between people face-to-face, Tveit said. "Justice is needed to be able to proceed, but the guilty should not be brought to justice by making everybody guilty, collectively," he said. The world is not moving in love towards reconciliation and unity, Tveit rued. "Even the communities of Christian faith are sometimes quite self-centerd and themselves a source of division and even conflict – with a negative effect far beyond their own circles.," he said. "In fact, now is actually a time when religion is one of the dividing factors in the world, or at least used and misused to divide, for other purposes than the strictly religious motivation." It is time to go back to basics, Tveit urged. "The message of Jesus Christ is exclusive in the sense that in a Christian church nothing else can define what the church is," he said. "The ecumenical movement itself, its institutions and organizations, might provide a temptation to serve the interest of one's own community and church, or even one's own personal interests." Tveit said that for the first time in the WCC's history, the term "love" will be included in a theme for an assembly, which is the highest governing body of the grouping of more than half a billion Christians worldwide. "The church is called to be the expression of this love in a broken and sinful world," Tveit reflected. "How could the ecumenical movement, trying to unite the churches in this call and to bring forth the signs of the reign of God – that is, justice, peace and joy – into this world – how could this movement be something other than a movement of love?" The WCC speaks truth to power, Tveit concluded: "We do so driven by love for all, and particularly for those suffering, occupied, colonized, excluded, non-privileged, marginalized, discriminated against." "We sometimes hear criticism from both sides. Some would ask how the WCC can be relevant to the real lives of people in the world today. Others might say that we are busier with the "world" than with the church or with faith in Christ as such." He said both challenges help the WCC to be objective about itself. "But how could we think that we do not have a calling to contribute to positive movements in the world - as it is, in real time? "We are not intending by this theme to be exaggerating or boosting our self-image, but we have to reflect on the biblical mandate that the church is called by Jesus Christ to do its mission in the whole world, and to share that God loved and loves the world." During his visit Tveit met with Fr. Alexei Smith, director of Ecumenical and Interreligious Affairs at the Catholic Archdiocese of Los Angeles; Bishop Mary Ann Swenson, vice-moderator of the WCC Central Committee; and Catholic Archbishop José Gomez. He also met with the Southern California Christian Forum.